The big news in his recent newsletter was the endorsement of what that crowd hopes is going to be a new troika…. Howle, Turner and Wilson. SUPPORT THE ELECTRIC UTILITY SALE and help Vero Beach get out of reported and unreported financial liabilities and debt! Don’t these clowns know that in every news source in the entire county it has been reported that the sale is dead…or, if not dead, it is at least stalled for the duration of the contract with nary a hope and a prayer to resurrect the sale? Makes you wonder how much credibility these newsletters are since the entire community knows the sale is dead. Hmmm. And, isn’t Charlie Wilson being supported by the Vice Mayor of Indian River Shores and we all know that the Shores are suing the City of Vero Beach. And, public records tell us that Wilson and Turner and Howle have raised most of their campaign funds from out of City residents. Makes you kind of wonder, who is their master? Hmmm. Oh, speaking of Newsletter’s – I just got a copy of the Lemmonator’s Yellow Paper and on a scale of one to ten it gets about a one and a half for content if you want to call the Lemmon’s fluff and a recipe article real content. But, if you have nothing better to read while you are sipping on your coffee at one of the many diners where you can pick one up….well, there are lots of ads. Frankly speaking, I am not in the habit of reading ads with my coffee. I like content. Now, speaking of reading ads, how about all those political signs out there. I am told that two new ones just hit the street. 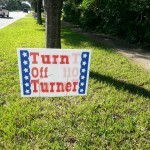 One sign says TOT…Turn Off Turner and the other one says ABC….Anybody but Charlie. When I get out and about I will take pictures and post. Oh speaking of Charlie. Here’s a scoop. I got a call from Dian George tonight and she tells me that there will be a hearing for Charlie Wilson on October 29th at 8:30 AM before the Florida Elections Committee in the Senate Office Bldg. Room 110 on S. Monroe St. in Tallahassee. With only a couple weeks to go, I am quite sure that Randy Old, Jay Kramer and Jack Shupe are the guys to vote for in this election. I call them the OK’S. Hey, I also heard that Damien Gilliams had a hearing date on 05-Aug but it was pushed back to 28/29-Oct for a similar thing as what Charlie Wilson is facing up there in Tallahassee. Maybe they can ride to Tallahassee together and save gas. Vero’s utility attorney Schef Wright who has no dog in the fight,has reported the sale can not be completed because of rock solid contracts binding Vero to the FMPA and OUC. Get ratepayers to pay $26,000,000 to FPL TURNER knows it, $90,000,000 WILSON and his phony numbers knows it,and “I will force the sale” HOWLE knows it too. TURNER ,CARROLL and FLETCHER ran up a $2,000,000 bill payable to lawyers and we are still where we were when WILSON came up with his phony numbers. People believed him then, but few believe him now. His rants and bully tactics will also cost him this election.When TURNER supported Tracy Carroll and her short term rentals she lost many people, when she tried to sell the dog park and Crestlawn Cemetery she lost more voters, when she gets her road widened at 10% of the budget ,she lost still more,when she went campaigning with the ALL ABOARD FLORIDA LOBBYIST she lost many more. Need I say more! Cedric, Why don’t you tell us how you really feel? So, If Howle is going to FORCE FMPA to sell to Vero Beach, where was he for the past four years. Maybe he should have been going to FMPA meetings with Turner. The two of them would have made a good team then and they certainly are becoming quite the team now. If this team were not so out of step with the City it might even be humorous. 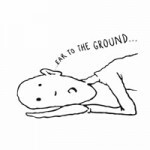 Wilson ,Turner and Howle aren’t out of step they are in a quagmire of their own creation. The fantasy of the Vero Electric sale is sinking them deeper in a good old fashioned Florida sinkhole. There is just so much baloney that the voters of Vero will take; we have reached our limit with lies, distortions, bullying and outside influences like the ALL ABOARD FLORIDA LOBBYIST who knocked on doors with the sell everything gang.We have also had enough of “doctored ” pictures. Today, Oct 17th,I passed 7 people holding signs for Turner and Howle. I know most of them . Five out of the 7 do NOT live in the city, but in the county. 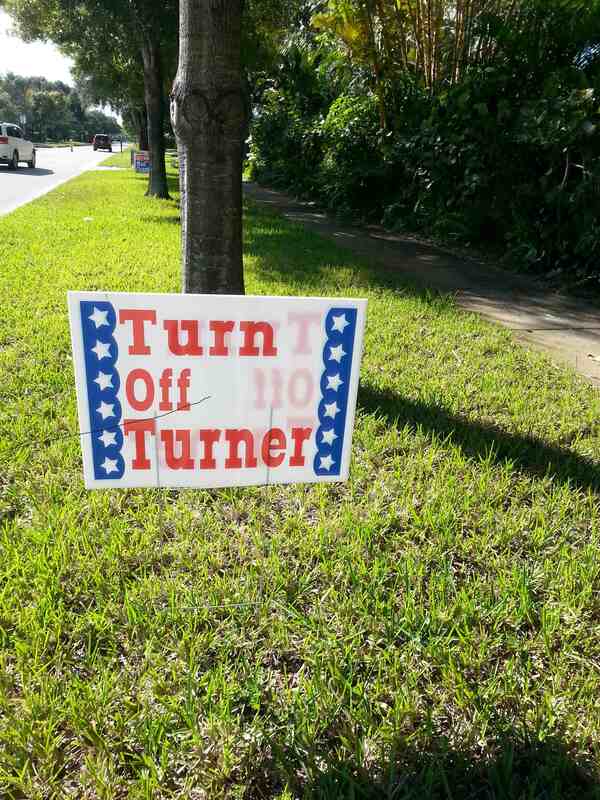 Just another case of outside interference into our local political process. There were NO signs for Charlie Wilson. These outsiders should mind their own business. Look at the Turner Howle campaign, Knocking on doors with the ALL ABOARD FLORIDA LOBBYIST, money coming into the campaign from outside sources, “doctored” photos ,etc. When I analyze their motives for their interference ,I come up with 2 reasons why they are doing this. (1) elect candidate who want to disincorporate the city and have it taken over by the county (2)they approve of the sell gang and their sell everything mentality. VERO FOR VERO!!!! Just had the first sign stolen already. I bet you can’t guess which on? It seems an ABC sign is missing from my property. Oh well…one for the Police books. I will make sure they keep a watch out for people on my property stealing my property. Can’t imagine who would have down that???? 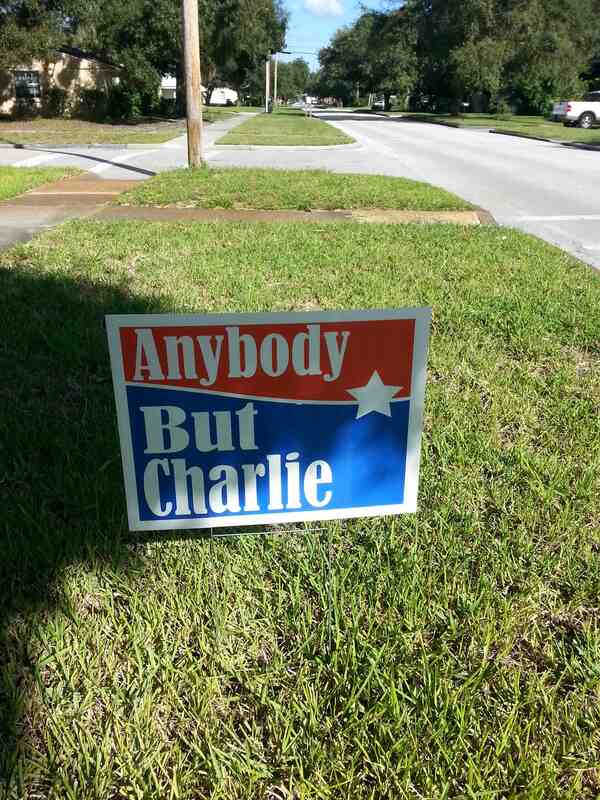 hmmmmmm, could it be Charlie? doesn’t he live in old town where those signs are? But our moral leader of the crusade to stand up for vero wouldn’t stoop that low. its not a good idea to talk about the Wilson messiah like that. its sacrilege. Three guess Linda and the first two don’t count. Call me. I have a person on the beach who has requested a sign. Do you have any more? I am curious to know how Mr. Howle, if elected, would force FMPA to back down on those “rock solid” contracts. For some reason, I don’t believe him. If he were really interested in the future of Vero Beach (instead of his own future), he’d tell us. Mr. Wilson fed us a lot of great-sounding numbers but they faded away. Mrs. Turner was our FMPA representative, but what did she do other than bad-mouth that group? I don’t know. Too bad we didn’t have Shep Wright from the start. I believe that is another boo-boo: using a law firm with ties to FP&L. Water over the dam. Mr. Howle is just blowing smoke and is talking tough about the FMPA because he was told to do so by his handlers. According to his money trail, he is being handled by the Tea Party gang led by builder Toby “the tea bag” HIll who used to be Toby the Common Ground King. Seems like the reason they are behind the Howle and Turner campaign is their strong desire to “liberate” the land to make way for future development. These are the same people who always find money to support The Salami whenever he runs for office. It’s the land stupid, it’s the land is their mantra. 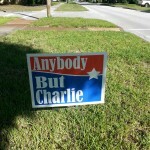 There is only three candidates that Vero Beach can be sure of and that is the OK’S…Randy Old, Jay Kramer and Jack Shupe. Bea, These tea party people won’t stop until the city is taken over by the county and big buildings go up everywhere. Barrier island residents are fore warned it will happen with the likes of Turner, Howle,Wilson and Salami. Look where Howle’s money is coming from. Cedric, Tea Party Toby and UP Chuck Mechling are still trying to control the Big Growth ticket and they do it quietly behind the backs of the innocent – low information voters. Read Lynne Larkin’s guest column in Inside Vero and you will understand. I guess that would be called Free Speach Linda….LOL Nice signs. 1. Charlie can not find his shoe. It was probably on his foot that he put in his mouth. 2.Which am I?- a mentally unstable disabled veteran or a defender of the public. Sorry Charlie, as a public defender, I cannot defend anyone when I know they are guilty. 3. Charlie is losing it. This is not a comment regarding his mental state. It is in regards to his desperate efforts to be elected to city council. Charlie cannot find his shoe. That is really funny Dian. I am sorry to hear that he is referring to you as a mentally unstable disabled veteran but you know how to translate what he says…. When he calls someone mentally unstable he is probably not near a mirror…because if he were looking in the mirror he would realize that he is the one that appears to be a bit unstable at this stage in his life. Any one who has to pay six months in advance on rent might be considered to be financially unstable. LOL And, I don’t know if he is a disabled veteran because I doubt he has ever served this country in any way…he only knows how to serve one master and that is himself, and, that he does not do very well. ABC (Charlie Wilson alias Wilson Russell)Is not a veteran and did show up at the V and put himself in front of the mike on Veteran’s day in the past. As far a his disabilities-he lost his shoe-he posted that on his Facebook. He said “where is the shoe?” So I think that is a sign that if he can’t find his shoe, he is not doing very well.